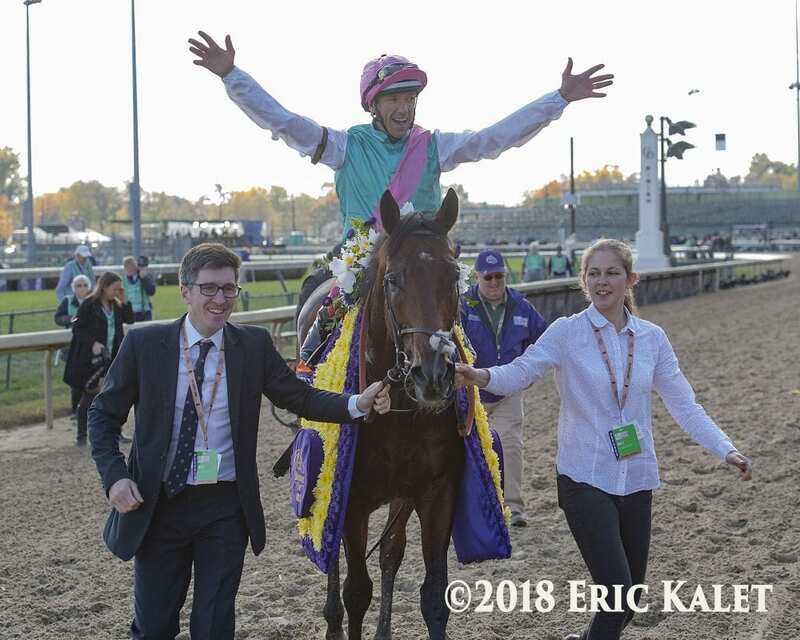 The Grade 1 Breeders' Cup Mile finish was a thriller for spectators at Churchill Downs Saturday, but it also proved a nail-biter for Sir Michael Stoute, trainer of victor Expert Eye (GB). Expert Eye and Frankie Dettori were shuffled farther back than is typical for the 3-year-old colt. The pair were fourth from last going into the first turn, but thanks to patient handling from Dettori, crept up on early leader Analyze It and challengers Divisidero and Mustashry. When swinging wide at the top of the turn, Dettori had a lot of work to do, but encouraged Expert Eye confidently for a fast-closing half-length win. Stoute admitted to NBC cameras after the race that Dettori had him a little frightened early, but everything came right by the end. “He got there just in time,” Stoute said with a smile. The win is the 13th Breeders' Cup victory (and trademark flying dismount) for Dettori. It's the sixth Breeders' Cup win for Juddmonte, and the eighth for Stoute. Expert Eye is a homebred for Juddmonte Farm and came to the race out of a third-place effort in the G1 Prix du Moulin de Longchamp. His previous credits include the G3 City of York, G3 Jersey and the G2 Qatar Vintage Stakes. The Mile is the first American start for the 3-year-old colt. Expert Eye is by Acclamation (GB) out of Dansili (GB) mare Exemplify. Favored Oscar Performance got off to a poor start and finished last. Expert Eye paid $13.80. There was a tight cluster of contenders for place and show, with Catapult coming second and pacesetter Analyze It hanging on for third. The final time for the mile was 1:39.80. See the full chart for the Mile here. This entry was posted in Breeders' Cup, Videos and tagged 2018 breeders' cup, Breeders' Cup, breeders' cup mile, churchill, churchill downs, expert eye, frankie dettori, juddmonte, sir michael stoute by Natalie Voss. Bookmark the permalink.